Investors speculate that stocks will continue to move higher. They bet on the "greater fool" theory that prices can rise indefinitely, because someone out there is always willing to pay more. In fact, investors are actually fearful of today's market. 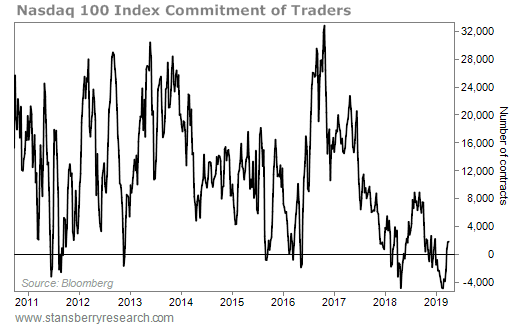 One way to see this is through the Commitment of Traders ("COT") report. It's a weekly survey that tells us what futures traders are doing with their money in real time. It's a great contrarian tool you can use to know what the crowd is betting on. When the crowd bets in one direction, the opposite is likely to occur. Futures traders recently made record bets on lower prices for tech stocks. The last time we saw a similar extreme was last spring. The index spent the next several months marching higher, rising by double-digit percentage points. Before that, we hadn't seen a reading this negative since 2010. And as I'm sure you know, tech stocks have soared hundreds of percent since then. As the bull market continues, traders will pile back into U.S. stocks. That'll cause a frenzy of higher prices. It's a virtuous cycle that will fuel the Melt Up... causing prices to rise higher than anyone could imagine. That's not happening yet. When it does, U.S. technology will be a big winner... Tech stocks absolutely soared during the last Melt Up in the late 1990s, racking up triple-digit returns in the last year of the boom. And I expect them to win big this time, too. So please, don't follow the crowd... Don't get scared out of stocks now. If you're still standing on the sidelines of today's rally, you could miss out on possible triple-digit gains before the final peak arrives. Don't make that mistake. Regular readers know Steve and his team use the COT reports to gauge sentiment across all sorts of asset classes. Recently, Chris Igou found extreme sentiment levels in another corner of the market that could point to a major rally in the months ahead... Get the details here. "Sure, it's been a record-setting year in the markets so far," Brett Eversole writes. "But that doesn't mean the rally is over." In fact, he says a recent rare event signals more upside ahead... Get his take on it right here. 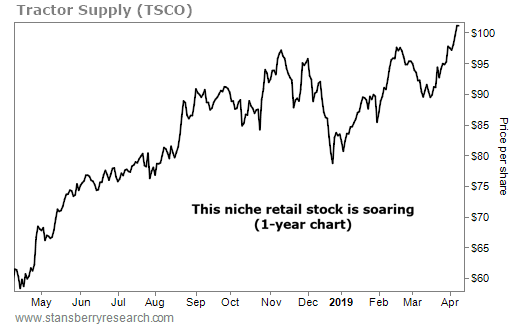 Tractor Supply (TSCO) is a $12 billion rural lifestyle retailer. Its product selection covers everything from auto parts and farming equipment, to garden supplies, to camping and fishing gear. As a “one-stop shop” for farmers and rural homeowners, this business draws in customers who stick around… which is great for sales. Last year, Tractor Supply reported sales of $7.9 billion, 9% higher than in 2017.